Replica outfit originally created for Barbie's boyfriend. Check them out up close. Very Beatles looking. 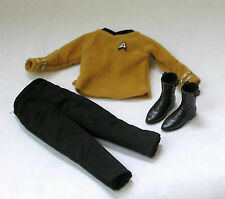 1:6 Scale Classic Star Trek doll clothes . fits Ken . Condition: Excellent UNUSED condition. Hello e-Bayers, Welcome to Find My Old Toys. Thank you for viewing our: VINTAGE STAR TREK BELT & BUCKLE 1976. Pics are actual item you will receive. Thanks for looking and good luck. We will combine shipping with other auctions, just wait for a combined shipping invoice. If you should have any issue with your purchase*****, PLEASE contact us BEFORE leaving anything other than 100% positive 5 star feedback. ***** We strive for perfection here at FindMyOldToys, and do our very best with professional packing and shipping within 1 business day. Thank you. Length top to bottom 140. STAR TREK 'Classic Cast' T-SHIRT. Size Small. Great Condition. Type Clothing. Vintage 1999 Star Trek T-Shirt. Featuring front and rear graphics of the USS Enterprise. This appears to be a size XL (size tag was removed). Preowned. Measures approximately 23” inches pit to pit. This item comes from a non-smoking owner. This is a Star Trek t-shirt based on the Next Generation with the crew as the design on the front. Top quality hand made reproduction of Mr Spock's uniform using original pattern and a sturdy cotton mix material, not a fancy dress replica. The quality is exceptional. Star Trek: The Next Generation Captain Picard alternate Starfleet duty uniform jacket and undershirt patterns. This unused pattern can make sizes from small to X-large. Complete with 3 pages of instructions written by Joseph Kerezman. This blue graphic t-shirt is composed of 100% cotton. Shirt has been worn but is in overall solid condition. Star Trek Logo Enamel and Rhodium Plated Cufflinks - Official Boxed. It is in good normal used condition. STAR TREK BORG SHIRT. Size: ADULT XL. Material: 50% COTTON 50% POLYESTER. Color: BLACK GREY GRAY RED. Size Small. Very Good Condition. Type Clothing. Made in USA. Shell: 80% New Wool, 20% Nylon. Height - 27 in. (see photo). Pre-owned, good condition. May have been from smoker. Minor wear on leather burgundy arms. See all photos. Very nice preowned Star Trek, Mr. Spock t shirt. "The Many Moods of Mr. Spock.". Size large, black w/ white & red, 100% cotton. Made in Honduras. Star Trek Voyager black t-shirt size L/Large, made by Gildan Active Wear. In used condition, there is a small hole in Seven of Nine's top (3rd photo) and the colour of the t-shirt has faded over the years/through repeated washing. 2016 Paramount Pictures issued Jacket. I was fortunate to go before it was shuttered in 2008. It has been worn and laundered. As a StarTrek fan, I have kept it in good condition. No stains, tears and the sleeves are not stretched out. All the buttons are original. Used, good condition, has stain on front of top. This is a 3 button polo from WeLoveFine on a Gildan shirt. CONVENTION EVENT. LONG SLEEVE T SHIRT. FAR BEYOND THE STARS. A hilarious take on the whole "Keep Calm" riff; note the details in the crown- Spock hands and Federation icons. NUMBER OF SIDES WITH GRAPHICS: 1, single-sided; blank back. MATERIAL: 100% cotton, preshrunk. Welcome. Would you like a Star Trek The Experience Las Vegas Polo Shirt. 23" pit-to-pit, 29" length, XL It's in decent pre-owned condition. If so press Buy it Now and it's yours. It can be on its way to you today from Ashford, Kent in the UK.